Safari Ltd. is a wonderful company who makes amazingly authentic, scale-model figures of so many different animals, dinosaurs, and even fantasy figures. They come in a variety of sizes from the miniatures (found in the Toob collections) to their Jumbo Replicas. Safari Ltd. replicas are intricately hand painted with amazing detail- they look identical to the real animals! I was so excited to review some animals from Safari Ltd.! We were sent the Wild Safari Giraffe Baby, Wild Safari Oragutan with Baby, Wild Safari Hippo Baby, Wild Safari African Elephant Baby, and the Wild Safari Alligator for review. Safari Ltd. figurines are technically recommended for ages 3 and older. I know that my little guy is still a little young to truly play with these, but every month he gets older I think he'll enjoy them even more. Currently, he loves holding them as they are the perfect size for little hands. As he gets older I know we'll enjoy these animals for all kinds of educational play, from sorting them by color or habitat to describing the features that make them unique. All kids love animals though and these are perfect to add to any animal collection. My nephew, who is almost two, absolutely loved playing with these animal figures when he was over visiting. He knows most animals from books and trips to the zoo, so he was very interested in these replicas since they are so very lifelike and intricately designed and painted. I even enjoyed "playing" animals with him. That's what so great about these- kids from 1 to 100 will be able to enjoy models from Safari Ltd. in some way, shape, or form. Safari Ltd. doesn't just have animals though. They also offer replicas of dragons, dinosaurs, pirates, fairies, knights, and more! Children love the lively colors and textures, making these toys ideal for imaginative play. No matter what your child is interested in, Safari Ltd. has the perfect educational toy for your child! Your little one will love to play with these replicas for many years to come. If your little one enjoys coloring and painting check out these Color to Discover pages from Safari Ltd. Follow & Connect: You can Like Safari Ltd. on Facebook or follow them on Twitter. Buy It: You can shop on your website or find a store near you. Win It: One lucky person is going to have a chance to win $30 in products of their choice from Safari Ltd. during my "One-derful" Birthday Bash Giveaway Event in September to help celebrate my son's 1st birthday! Safari LTD animals are so life-like. Kids love them. I enjoy reading reading your blogs about everyday family hints. 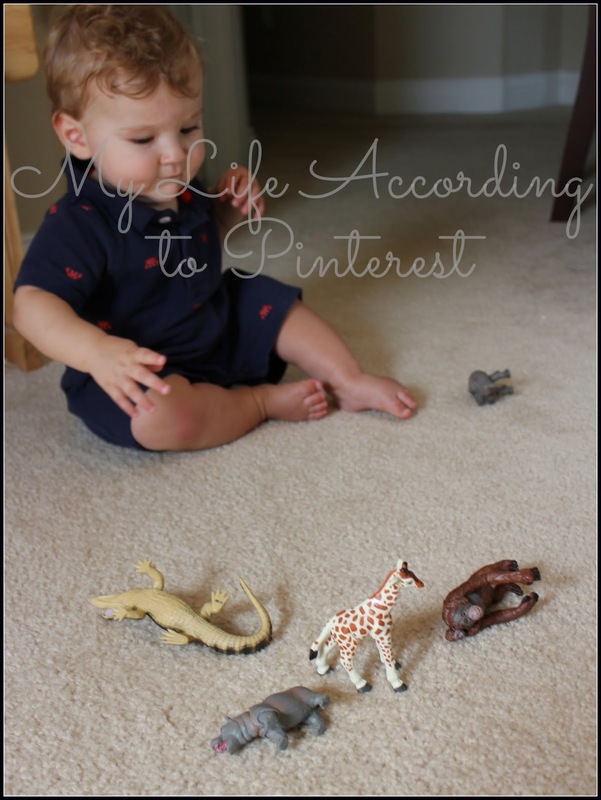 These are the cutest toys and my kids sure do enjoy playing with animals! I would like the farm edition. What fun toys! These looks great and encourage use of the imagination. Love! You will be pleased with these for a long time, my granddaughters have some monkeys and gorilla that we got 5 or 6 years ago in San Diego and they still play with them and they are in great condition. I like the picture of your son and him playing (knocking) all the animal over until he got the giraffe last, Very cute. My son loves playing with these animals - we already have a small collection of them. They're great! My kids LOVE Safari Ltd. toys! We collect the Toobs and buy the bigger replicas for special occasions. The life cycle sets are also amazing and all of the toys are educational, which is perfect because I homeschool my preschoolers and they love using Safari Ltd. toys in their learning activities. Great review and giveaway! Wow, I love how realistic they look, they don't look like any of the "toys" I've seen in the store. My boys, who are crazy about dinosaurs and animals, would be so excited to have a couple of these to play with. I love how they are educational and life like. We have the binoculars and love them! I love that they have dinosaurs, what boy wouldn't want to play with them. They are realistic looking to, so adults would like them as well. This seems like a good company in regard to getting what you want or need. The animals look like they are of quality, which is the most important thing. I think my son would love these, as he doesn't really have any model animals to play with! My son would love all these toys but especially the dinosaur toys. All of the animals you reviewed looked so realistic and high quality. These would make a great stocking stuffer. My son is 3 years old and loves animals. I really like that they have pirates, knights and dinosaurs as well because he loves those too. I like the toys that are educational and not just about pretend fighting. We have some safari ltd. toys and my 3 year old loves them! I would love more as a Christmas present! These animal toys by Safari Ltd. look so life like I know the kids will have hours of fun playing with them. They will last for years and you can wash them as well for years of fun.